Topiary ball in leaf effect look great in borders, hanging basket and window boxes. 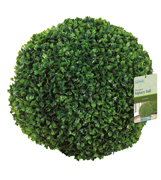 This topiary plant ball is UV and weather resistant ideal for outdoor and indoor use. Comes with removable hanging galvanised chains. Artificial ball box effect. is UV and weather resistant. 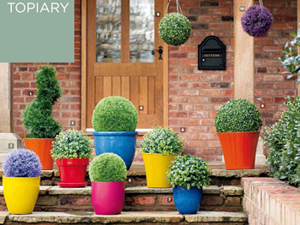 Topiary ball effect look good in hangin baskets, borders and containers. Comes complete with removable galvanised chains.